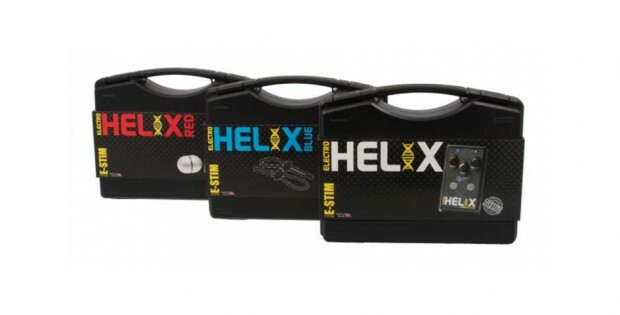 E-Stim Systems have released their latest power box called ElectroHelix. It features a lot of modes known from the original Series 1. So it still has a continuous mode, (now called Flo), an improved Pulse Mode along with a Manual or Fire mode as well as two additional modes, Milk and Tease. All of this packaged in a smaller sized unit which fit into the palm of the hand. E-Stim Systems have packed more power into the ElectroHelix making it more powerful than the Series 1, but by retaining the step-less controls there is still plenty of adjustment for the user. All 5 modes can be adjusted for ‘Feel’ so once again giving the user the ability to vary that sensation from a soft and sensual tingle to a harder more prickly feel. The product is packaged in a hard, moulded carry case, and backed by E-Stim Systems’ Lifetime Guarantee. Available in three versions the ElectroHelix, the Helix Blue and Helix Red packs. Available now from stock and with a starting retail price of £109.